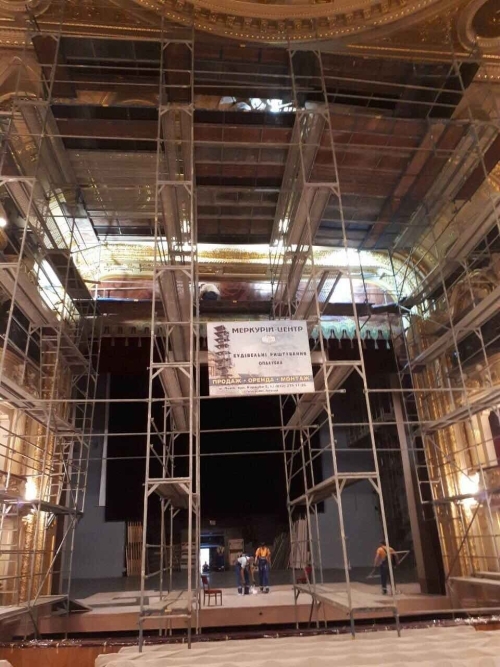 For the restoration work, a complex installation of the frame stack scaffolding of the main stage of the opera and ballet theater was performed. Solomia Krushelnytska. In order to provide a stationary platform, a frame structure frame was constructed at a height of about 17 meters. In the process of installation for additional needs of the restrainters, additional console tiers are installed for access to the balcony lodges and Sofit sections. Installation is complicated by the displaced horizon, therefore the basis of the design is simultaneously installed in the orchestra pit and directly on the stage. The features of such a design are the installation of four independent sections to the required height using frame scaffolding.